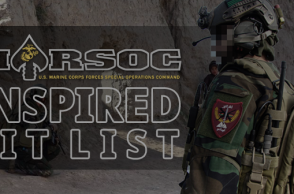 Specna Arms SA-G10 – just another G36 replica? 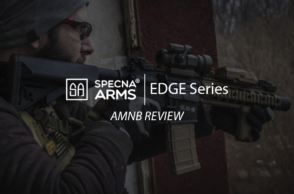 Specna Arms, who have become known as a provider of affordable yet high quality M4 AEGs, have come out with a completely new line of rifles. 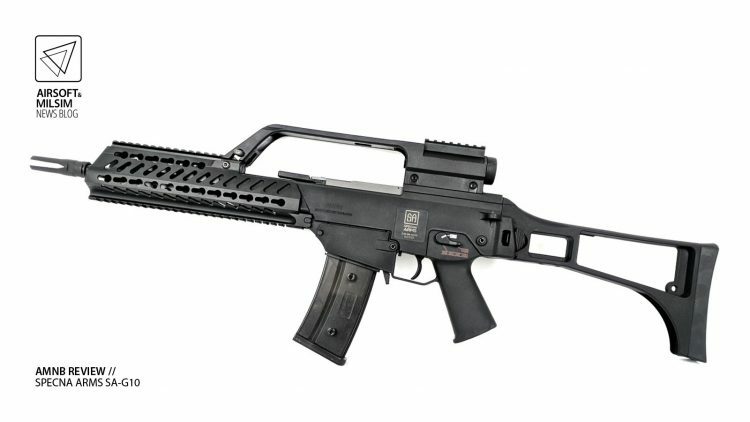 As the moniker implies, the G-series expands the lineup of SA rifles with G36 AEG replicas. The speciality of the G-series, in addition to the quick spring change that we’ve learned to expect from Specna Arms, is Electronic Blowback, where the charging handle and fake bolt travel backwards and forwards with each shot, bringing into play a further feeling of realism. 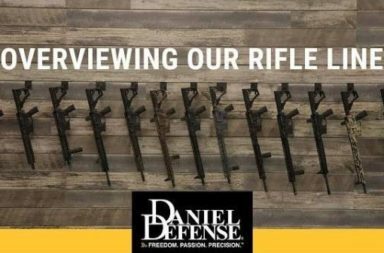 In this review, we are taking a closer look at the SA-G10 model, which is a full length rifle with a KeyMod handguard. 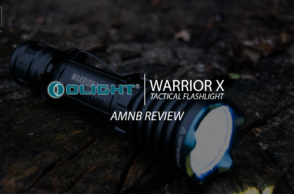 The review sample was kindly provided for review by Gunfire, and at the time of writing the G10 retails for 247.77 EUR. The gun is delivered with just a high capacity magazine that holds around 350 BBs. 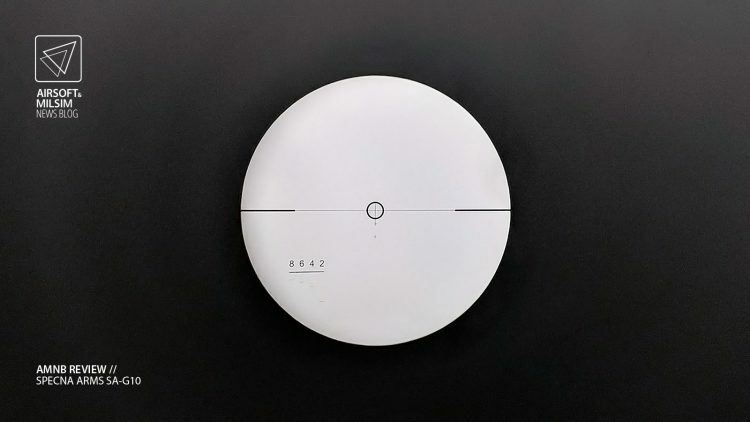 In short, users will need to provide their own batteries. This is all well and good, as the trend among players is to go for LiPo batteries anyway, which would leave the commonly provided, subpar NiMh batteries as just more hazardous waste to get rid of. I hooked up a Specna Arms 1200 mAh / 7.4 V / 25 C LiPo in order to do some chrono tests. With 0.28g BBs, the G10 clocked in an extremely steady average of 1.57 Joules and 11.6 rounds per second. Tests were run on an XCortech X3200. One noteworthy thing that came up during test firing was that as I was personally not used to EBB guns, the sound of the system first made me think the gun was double shooting on semi. This wasn’t the case, though, it was just the sound of the charging handle coming to a stop at the front. 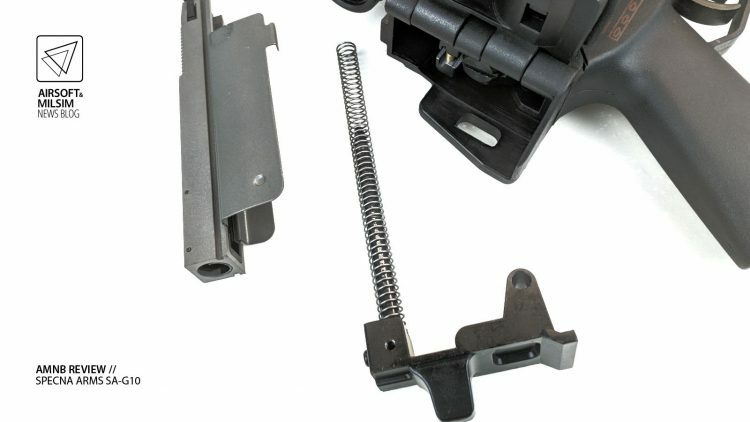 The EBB system also makes use of what in a real steel G36 would be the bolt release inside the trigger guard. 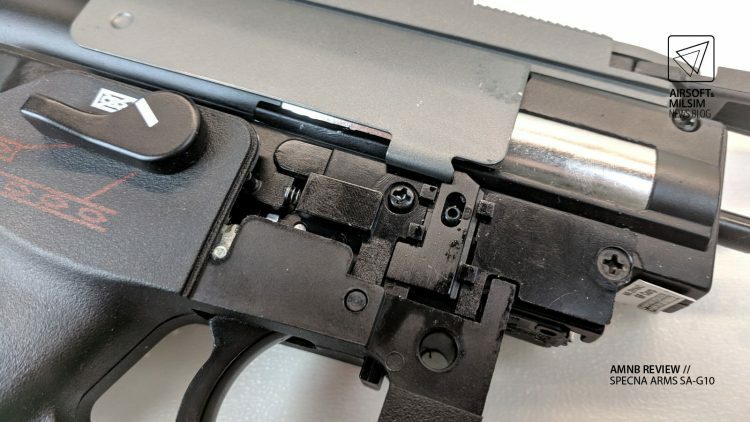 In the AEG, this button can be used to lock back the charging handle, and pressing it also releases the anti-reversal latch inside the gearbox, letting the piston move to the forward position. The gun is wired to the front, and the handguard needs to be removed in order to insert the battery. The barrel is free floating, i.e. the handguard is not in contact with the barrel at any point. 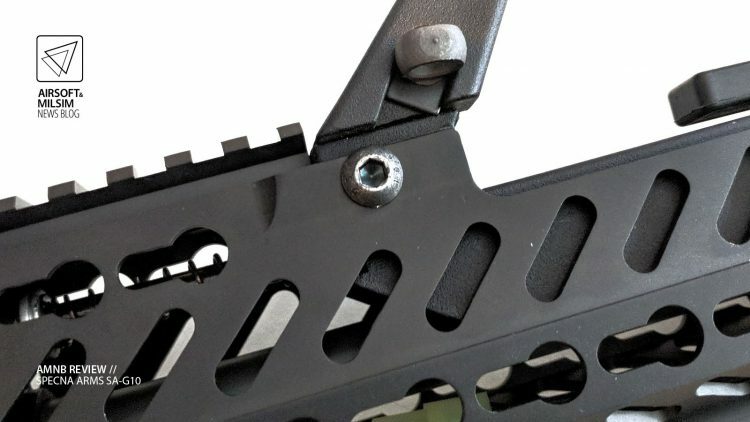 Because of this the handguard is attached to the receiver with a nut and bolt instead of a more typical push pin. While this necessitates the use of tools in order to access the battery compartment, it also ensures the handguard stays firmly in place during use. The KeyMod handguard has regular Picatinny rails on the top and bottom, and KeyMod attachment points on the sides. The battery will remain visible through the handguard slots, which is something to keep in mind if you’re looking for complete realism. The first thing that comes to mind when handling the gun is sturdiness. The look and feel are both spot on, and there are simply no wobbles or creaks anywhere to be found. It’s hard avoid drawing parallels with the JingGong G36 guns, as they are most likely very familiar to anyone who has played airsoft for any length of time. While the JGs are built like tanks, the Specna Arms G-series manages to take it a notch further still. The build quality is amazing, as are the materials. As an example, when you fold the stock forward and then wish to fold it back out, there’s some serious force that you need to use for the stock to release, and once it locks into place, it is simply rock solid. The G10 has an integrated 1.5 X scope built into the carry handle, with adjustment screws on the top and on the right. The top side of the scope also has a piece of rail space for an additional red dot or other optic. If desired, the rail section is removable by undoing two screws on the top. 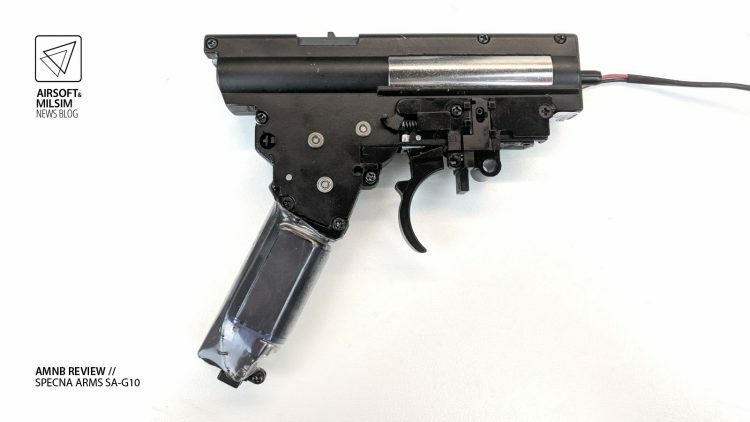 Hop-up is adjusted with a rotary knob from the ejection port or from the top of the receiver once the charging handle is pulled out of the way. The outer barrel is made out of metal alloy, and the inner barrel is brass. The external parts on the G10 seem to share dimensions with JG parts, and a BattleAxe STANAG adapter can also be fitted without problems. The two body pins holding the upper and lower together are both steel, and tight enough to require a few taps of the hammer to budge at all. In order to change the spring, the rear body pin needs to be first taken out. Then, as the stock is folded, the backplate behind the gearbox can be removed, revealing the charging handle spring and spring guide. The charging handle and mock bolt can also be removed from the rear of the gun at this stage by simply pushing them out. In order to get to the mainspring, you first need to undo the locking screw on the back of the gearbox. Once that is removed, the actual mainspring guide is revealed, and can be removed with a 6 mm allen key by pushing in slightly and then rotating half a turn. 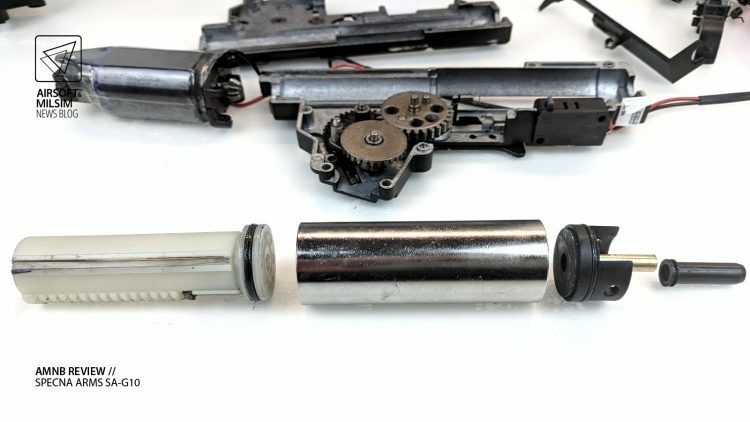 Getting to the gearbox is quite easy, as you simply need to remove the back and front body pins and the magazine well. After this, the whole lower receiver can be pulled out of the upper. 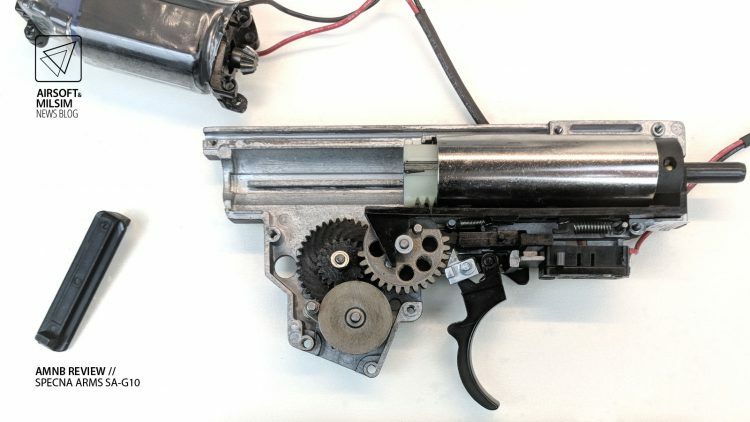 As with many V3 gearboxes, the motor is attached to the gearbox shell, so you need to undo one the centre screw on the pistol grip bottom plate to release the motor, and remove the pin above the trigger. After this, the gearbox and motor can be pulled free from the pistol grip. Some fiddling is required to clear the fire selector parts during removal, but as nothing will fall out, you can take all the time you need. 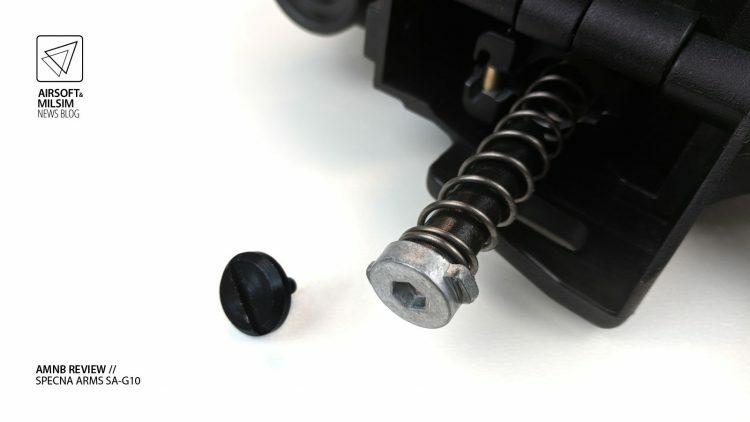 The gearbox itself is a proprietary V3 derivative, as the EBB system requires a slot on top for the operating bar to travel in, and the bolt catch button requires some extra screws to hold it in place. Shimming on the gearbox leaves something to be desired. Judging by the shims found inside, efforts have clearly been made to seat the gears properly, but there is still quite a bit of free play. Nothing out of the ordinary for a stock gun, though. 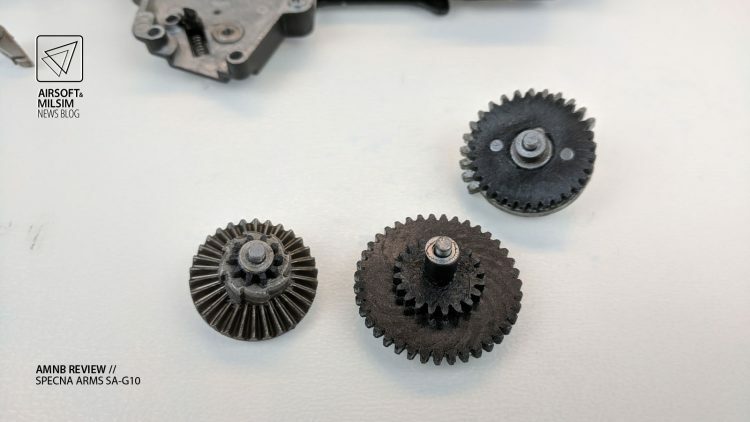 The sector and spur gears sit on 7mm bushings, while the bevel gear has 7mm ball bearings. On the left hand side of the gearbox, there is a lever connected to the bolt catch, which releases the ARL when the button is pushed up. The wiring has been routed expertly, and all soldering is neatly done. The motor and the wires around it are covered in a plastic sheathe to further streamline the assembly. 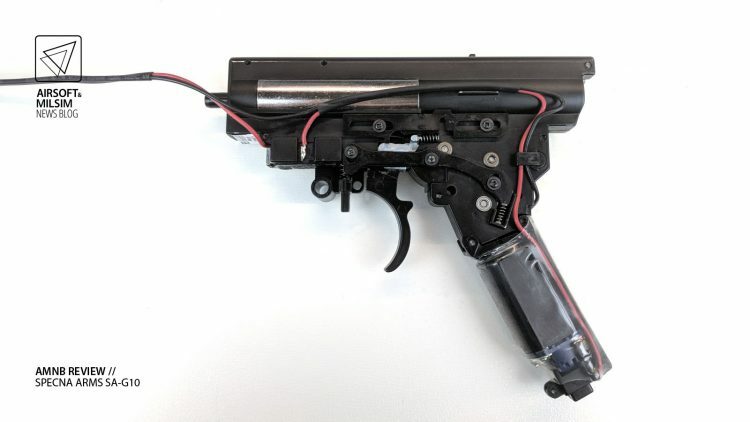 The more traditional metal trigger contacts are absent, and the trigger instead actuates a microswitch, which fires the gun. This adds a bit of realism, as there is a clear break in the trigger. The EBB system operating bar and the slot it travels in are situated on the top part of the gearbox. The system works in a fairly simple mechanical manner. The piston moving backwards catches the hook on the bar and pushes it along the slot, which in turn pulls the charging handle and mock bolt backwards. As the piston moves forward, the EBB return spring pushes the moving parts back towards the front. There isn’t a whole lot of grease to be found anywhere in the gearbox, which is somewhat surprising, considering the otherwise high quality of manufacture. All gears are steel, with a two-tone black and silver colour scheme. The piston is nylon, with plastic teeth apart from the final tooth, which is again steel. The cylinder is made of a lightweight alloy, and the cylinder head is plastic with a single o-ring. The nozzle is 24.9mm in length, and comes without an o-ring. Airtightness of the compression parts is nevertheless fairly good, with only a minor leak between the nozzle and cylinder head. The motor is unmarked, and built with ferrite magnets. Trigger response with a 7.4 V battery is nevertheless still pretty snappy. 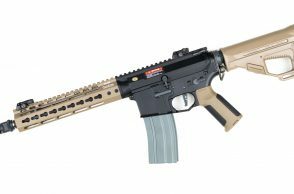 The new G-series from Specna Arms shows a lot of promise. The externals are simply top notch, and the look and feel of the guns is amazing, especially for the price! The possibility of releasing the anti-reversal latch without removing any parts is also a welcome addition. 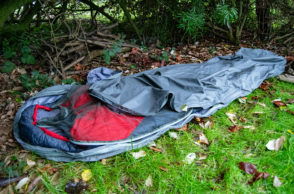 The EBB system may divide users into two camps, but those who do not enjoy it can easily disable it if they so please. 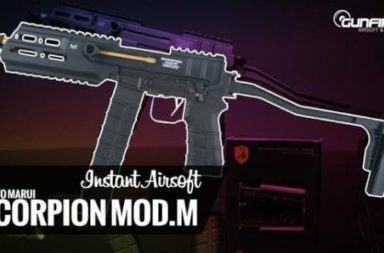 External parts compatibility with other G36 AEGs is also a big bonus. For anyone in the market for a new G36 series gun, I can’t recommend the Specna Arms G-series highly enough! 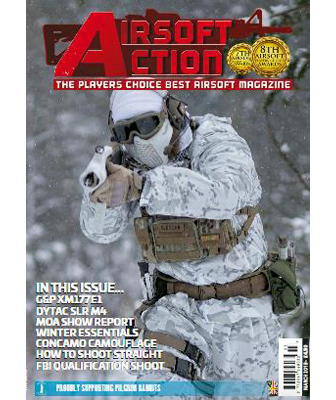 Hey, I love this article, thanks for sharing this information with the Airsoft Community. 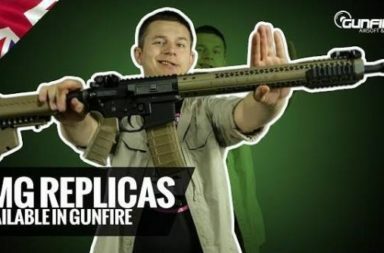 What do you think about the, Evike - Colt Full Metal M4A1 10" KeyMod Airsoft AEG by Palco. 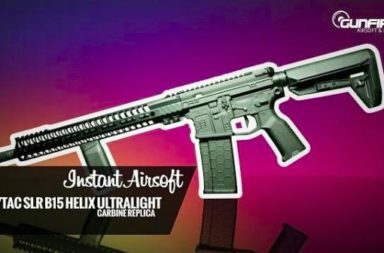 I have read multiple reviews on the product, however, I am a bit apprehensive about purchasing this gun because of the price. 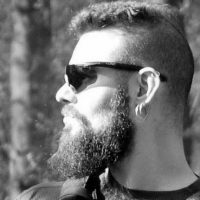 After reading your review I can justify the purchase, but the review at Airsoft-facts.com sounds a bit too good to be true. I am looking for your expert opinion, on whether or not I should purchase this gun. What about the hop-up unit? You only mentioned the ring adjustment.